When it comes to its tax environment, Canada holds a competitive advantage over its neighbors near and far. Canada's new millennium federal budget of 2000 was the most dramatic tax-cutting budget in Canadian history.1 It set in motion a decade of business tax reform and reduction that transformed Canada's competitiveness within the global economy. Once a high-tax jurisdiction, Canada has become the most tax-competitive location among the G-7 countries, and has the fiscal and political capacity to reduce business taxes further. But will it happen? Can Canada become a "northern tiger"? To answer that question, let's first examine the relative importance of taxation as a business cost factor and look at some of the evidence revealing that business taxes in Canada may now be a competitive advantage. According to the World Economic Forum's Global Competitiveness Report 2009–2010, Canada is the ninthmost- competitive country in the world. This research report evaluates 133 countries according to numerous variables that comprise the "12 Pillars of Competitiveness." Together, these factors shape and influence a country's productivity and prosperity. In the Forum's study, business taxation is just one of more than a hundred variables that are captured, weighted, ranked, and scored. Canada obviously scores well in most categories to earn a top-10 ranking. But the wide range of factors considered raises important questions about how taxes should be compared, and whether policymakers, pundits, business leaders, and commentators place too much emphasis on their importance. Three separate studies — one in the United States, one in Canada, and another global — provide some perspective on the relative importance of taxation in the investment location decisions of corporations. The first is the 2010 Global Manufacturing Competitiveness Index, a report prepared by Deloitte and the U.S. Council on Competitiveness. Its ranking of 25 "competitiveness drivers" places the "tax system" as the eighth-most-important factor, well behind the leading factors that included the quality, availability, and cost of labor; material and energy costs; a healthy economic and financial system; and capacity for manufacturing innovation. The second is an annual manufacturing Outlook publication from Grant Thornton accountants. It, too, examines the business factors that are creating opportunities, risks, and challenges to business. In Canada, "tax competitiveness" ranked 17th out of 20 among challenging business factors in the 2008 survey, with only 16 percent of business leaders choosing it as a major business concern. More than three times as many respondents selected increased operating and material costs, energy costs, and domestic economic conditions (i.e., the recession) as their key concerns. The third study, also from Grant Thornton, is International Business Report 2010: Taxing Times, in which owners and directors of privately held businesses in 36 countries were asked if taxation would affect their decision when considering to locate an operation outside their home country. The global average indicated that 83 percent would be influenced by tax regimes, but this was not universal. It is known that changes in corporate taxation can have direct and measurable impacts on levels of foreign investment, capital deployment, and employment, but it is not a simple, linear relationship.1, 2 These studies indicate that the prevalence of corporate taxation as a key business concern varies widely by country. Nonetheless, it is also clear that although many factors influence business competitiveness and investment location decisions, tax competitiveness is not to be ignored. What Say the Tax Experts About Canada? So if tax regimes are important to business investment and location decisions, what has Canada done to improve its standing, and how does Canada compare in either absolute or relative terms? Beginning in 2000, Canada began a long and steady journey to reform and reduce business taxes. The general corporate income tax rate was gradually reduced from 28 percent to 21 percent in 2004, which matched the existing lower rate for manufacturers. Subsequently, both rates were reduced year-over-year from 21 percent down to 16.5 percent in 2011. For the most part, provincial governments also reduced their corporate income tax rates during the last decade to magnify the overall effect, turning Canada's disadvantage into an advantage. It is important to recognize, however, that statutory ("face") rates of corporate income tax are not good indicators of the amount of tax a company pays.3 To understand a country's relative advantage, all taxes and allowances should be accounted for to determine a "total tax rate" or "effective tax rate." One report that is current and makes a thorough assessment of business taxes around the world is KPMG's supplement to their Competitive Alternatives study of global business costs. The study is important because it compares the total tax burden faced by companies in each country, including corporate income taxes, capital taxes, sales taxes, property taxes, miscellaneous local business taxes, and statutory labor costs (i.e., statutory plan costs and other wage-based taxes). Each category of tax payable by companies is assessed to determine each effective tax rate, and then the results for each tax category are ranked and subsequently combined to determine a "total effective tax rate," and a "total tax index." Canada is shown to be a clear business tax leader among the 10 nations included in the study when the "total effective tax rate" is taken into consideration. Mexico ranked slightly better than Canada in 2010, and Canada maintained a clear advantage over its biggest trading partner, the United States, in all tax categories. 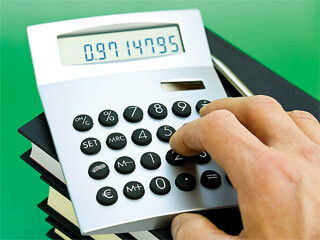 The importance of looking at the net effect of all business taxes on profitability cannot be overstated. The beneficial decline in the face rate of a corporate income tax can be more than offset by changes to payroll taxes, capital taxes, sales taxes, depreciation rules, other business levies, or broadening of the tax base.4 Taking a complete or holistic view of business taxes is necessary. Another major tax report conducted by PricewaterhouseCoopers (PwC) — Paying Taxes 2011 — examined tax systems in 183 countries around the world. The global accounting firm calculated a total tax rate (TTR) in each country, being the sum of all the different taxes and mandatory contributions payable by a company after accounting for allowable deductions and exemptions. The TTR is "designed to provide a comprehensive measure of the cost of all the taxes a business bears." The comparative results show Canada in a relatively strong competitive position versus its NAFTA partners, but also against numerous G8, G20, BRIC, and EU competitors when all taxes from federal, provincial and state, and local jurisdictions are taken into consideration. These favorable rankings for Canada illustrate the importance of recent tax policy changes, which include corporate income tax reductions by the federal government and all of the provinces (each to varying degrees); the harmonization of sales taxes in some provinces (most recently BC and Ontario) with the federal GST (a value-added tax); and the near elimination of capital taxes across the country. Interestingly, in the PwC study, Canada also ranks favorably for other business tax factors, such as the ease of paying taxes; the number of business tax payments; and time required to comply. In addition, at the federal level, Canada has some of the most aggressive and lucrative research and development tax credits in the world. At the provincial level, incentives programs have been designed to support key industries (e.g., aerospace in Quebec) or dedicated to major projects (e.g., Ontario's Strategic Jobs and Investment Fund). Moreover, work force programs, energy cost programs, and others can be found in many provinces. It is true that income tax credits for job creation and local property tax abatements for new capital investment are not as common in Canada as in the United States; in fact, in many locations these types of incentives are legislatively forbidden. However, these types of U.S. incentives offerings are necessary to reduce the overall U.S. tax burden in order for U.S. economic development organizations to compete with alternative locations outside the country. Looking at some hypothetical scenarios, one still often finds that Canada holds a tax cost advantage when incentives are taken into account. Good Progress, But What's Next? It is clear that Canada has come from the back-ofthe- pack over the last 10 years to become a tax leader among G-7 countries, and to also hold a much more competitive position within the group of 34 OECD countries. The trajectory of tax reductions has been clear, but in the aftermath of the Great Recession, it is fair to ask whether or not Canada's tax competitiveness can be sustained. 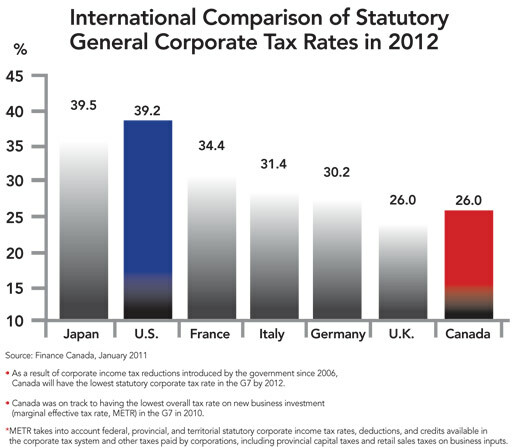 Like most countries, Canada's ability to improve tax competitiveness is derived from two sources: fiscal and political. Canada experienced real declines in economic output, corporate and personal incomes, and government revenue during the recent recession. After 12 consecutive years of federal surplus, deficits came as a surprise to most Canadians, and the shortfalls accumulated quickly due to stimulus spending. The result is that net debt-to-GDP ratio has risen over the last two years, but Canada's total net debt (32.2 percent) remains lower than that of many of its key trading partners, and less than half of the average net debt for "advanced economies" worldwide (67 percent).5 Canada's deficit is already falling again, and, in the absence of further unexpected economic and fiscal stress, Canada appears likely to use its fiscal health to further reduce debt and strengthen its tax competitiveness. At the time of this writing, Canada had just completed a federal election. The new Conservative majority government has pledged to continue Canada's progress on the tax front by reducing the federal corporate tax rate from 16.5 percent to 15 percent, where it is meant to remain for a two- to three-year period. These tax reductions will occur at the same time that Canada's deficit is reduced and eliminated — a task expected to be achieved in 2–4 years. All political parties support this objective. It was a Liberal government, after all, that slew Canada's deficit dragon in the 1990s and set Canada forward on its path of 11 consecutive surplus budgets, debt repayment, and personal and corporate tax reduction. On a global basis, Ernst & Young's Business Risk Report 2010 states that in many countries, budget deficits and rising debt pose a threat of "substantial increases in taxation in coming years. "6 In Canada, despite recent challenges, it has become "the new normal" to expect fiscal surplus and competitive tax rates. Both of these outcomes are achievable in the near- to mid-term. Successive Liberal and the Conservative governments have transformed and improved Canada's business tax profile. Today's debate revolves mainly around how and when Canada will become even more tax competitive. 3 "Paying Taxes 2011: The Global Picture," by PricewaterhouseCoopers, the World Bank, and the International Finance Corporation, 2011. 5 Total Government Net Debt (% of GDP) comprises the year-end stock of all government gross liabilities (both to residents and nonresidents) minus all government assets (domestic as well as foreign). The debt reflects a consolidated account of central government plus state, provincial, or local governments. Source: International Monetary Fund (February 2011). 6 "The top 10 risks for business," page 40, in the Ernst & Young "Business Risk Report 2010."